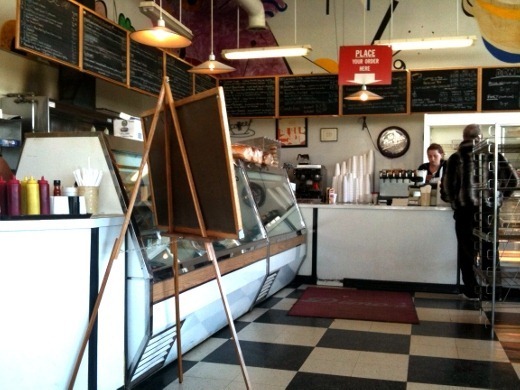 This week, when Dimo’s posted a link to my blog post about their sandwiches on their Facebook wall, it reminded the huz and that while we have returned for sandwiches on more than one occasion, we still haven’t tried Dimo’s breakfast! This morning, we made it in to Dimo’s for brunch! They were quite busy but we had no problem finding open seating, and our food was ready fairly quickly. We both ordered a Western Omelet for brunch. Giant!! SO. MUCH. TOAST! Mmm, buttered rye. The omelet was really good! 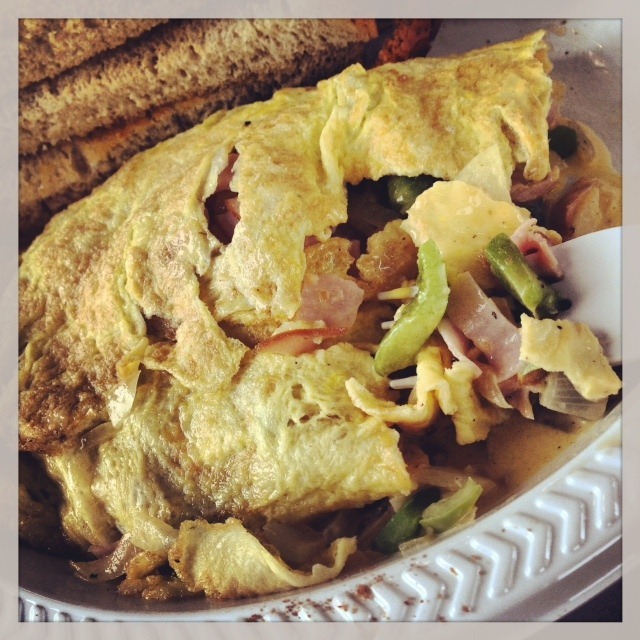 It was SUPER meaty – filled with lots of ham, onion, green pepper, and cheese. The veggies were nicely crisp tender, and not soggy, which I liked. Upon first slicing into the omelet, the cheese was a little watery around the edges, but once you approached the interior of the omelet, it was super melty, cheesy, deliciousness. Nice and hot and fresh too. My only complaint would be that I’d like maybe two pieces of toast and a side of hash browns, rather than four pieces of toast. 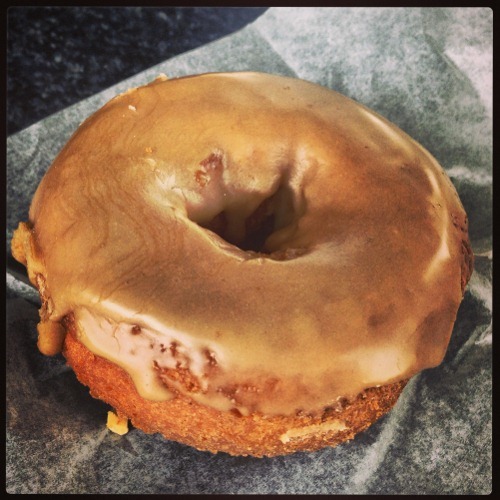 And we split a donut – maple glazed. Just love that crisp exterior. So tasty dipped in coffee. 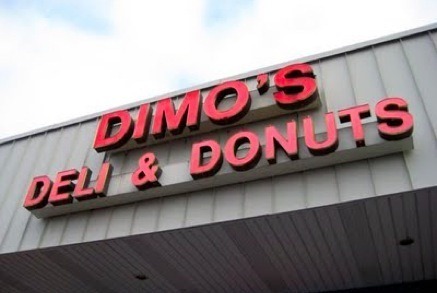 I recommend Dimo’s for breakfast. 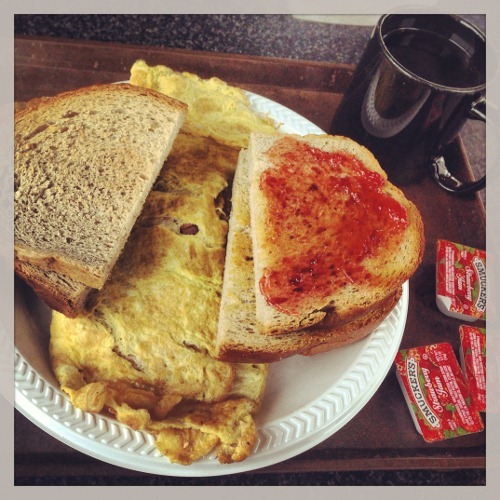 I was stuffed after eating only half of my omelet and toast – and brought the rest home for another meal. Very generous portion!